Mining nature trail (MNT) displays mining activity from middle ages until recent times. It goes through areas with pyrite and antimony ore extraction and marginally it touches gold mining. It starts at a place where in the middle ages a miner settlement Zumberg (1) was situated, it goes through Pezinok spa (2), very popular in its time, it is taking water from mining works. Also, it goes through Ferdinand – Karolína field (4), where in the 50s of the 20th-century pyrite mining was carried out. 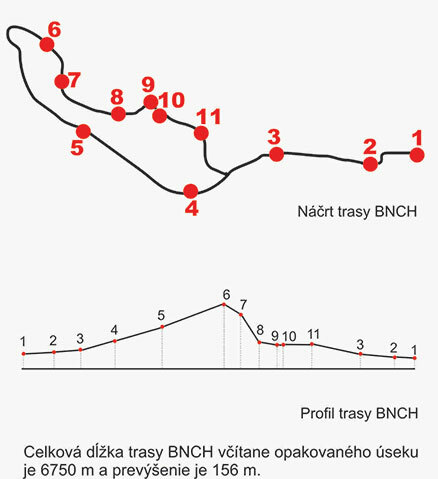 Partially it shows gold mining (5) and continues to the opencast antimony mine (6) – the highest place on the BNCH route. After that, it goes down along the Antimony (7) and Pyrite (8) adits to the ore dressing objects (9) and to the court of the Rudné Bane company (10). From there over the settling pit, it continues towards the „youngest“ adit Budúcnosť (11) and comes back to the starting point. The miner settlement was established in the second half of the 13th century. It was founded by German colonists. In 1390 there was a church in the town (Zsomberg ecclesia) and a pastorate. After the destruction of the town in the 16th century, the repaired church was used by Pálffy family. Until 1740 it was used by the citizens of Cajle too. At the location of the former miner settlement, Zumberg in 2010 members of the mining alliance built a chapel of St. Clement – patron of the miners. The bath could have been found on the right bank of an old river, at the bottom of mountain Ober Hausberg. They have mentioned already in 1590. They belonged to the town council. In a bricked bathhouse from 1777 there was a possibility to rent a room and in the booths, there was access to cold and hot water. Water – used for operations was running from adits Ferdinand and Jozef. Effects of the healing water were beneficial for hydropsy, kidney sand, eczemas, joint pain and other ailments. The bath ceased to exists in 1923. Before building up the company in the side alley of Hrubá dolina in these parts were administrative and operational miner buildings. In the close proximity, there could be found few mills, among them, also stamping mills and paper making factory. Pyrite mining started at the end of the 18th century and beginning of the 19th century. It was the main material for making sulfur and sulfuric acid. In the 50s of the last century, there were still mining works on the deposit. From the older mining works here existed the Emil shaft, adits Emil, Gedeón, Hilar and hereditary Ferdinand. Gold mining in Pezinok is divided into two periods: a) quarrying in the middle ages, allowed in 1339 by king Karol Róbert, it involved washing in rivers and quarrying at the bases of golden seams found on the surface. We don’t have data from 16th and 17th century. b) resurrection of the gold mining by Jozef Entzler in the 18th century. 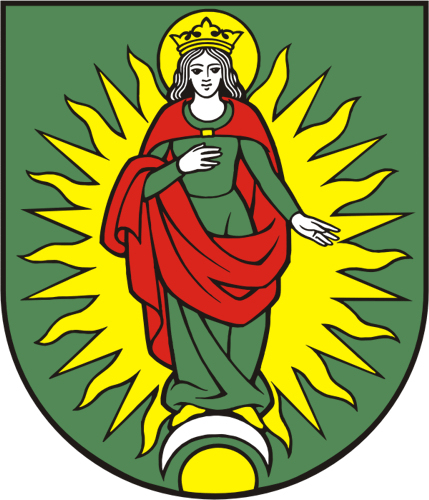 Their „mining highnesses“ Mariana, Terezia, and Jozef (MTJ) carried out mining works in old adits around Altstadt. Their success was scarce same can be said for their descendants. In Slnečné údolie he built „tajch“ (water reservoir) to have enough water for every stamping mill. Part of the antimony deposit which could have been found on the surface was quarried in an opencast mine. Parts of ores were after the drill and blast works, transported to the container by drilling scraper and from there with a locomotive for further processing. The beginning of the antimony mining is dated to 1790. Mining was not consistent and was made by small mining companies. It was sped up at the beginning of the 20th century, but mostly after 1939. The deposit was accessed by several adits. Methods of quarrying changed the same way as the related mining tools: drill blast technology, loading, and transportation technology. At the first, they mined ores with 2%Sb, later with 1,2%Sb. Was used as a prep hallway for the pyrite quarrying. Its first part started to be drifted in 1939. Later it was prolonged in NW direction and after bursting in the Central staple pit it was used as the main tunnel. Within the scope of geological research, they continued NW and SE direction too. The tunnel is used for water extraction of the whole central part of the deposit. Mining transportation is divided into vertical and horizontal. For vertical transportation, they use staple pits between fly-over hallways and for horizontal they use mining carts. In the past enrichment of the mined antimony ore was made in the front of the adits. Gradually the quality was increased by the invention of mechanical and chemical tools. In Pezinok in 1906 the first flotation finish for ores was put in function it was the first in Austria-Hungary. Ore finishing is made up from several different processes: granulation – through different granulators and sieves approximately 25mm sized ore is obtained, grinding – round mills of the flotation do it – haze from the mills with addition of some reagent agents is separated to compounds of antimony and mine debris which is moved to the settling pit, drying – is provided by filter press. The final product is antimony concentrate which is further processed in non-ferrous metal works Vajsková. Rudné bane Pezinok the name Rudné bane is used from 1950. Before they were Antimónové banícke a hutnícke závody (from 1926) and Rudné bane a huty na farebné kovy (from 1946). With the evolution of the engineering and new technologies amount of the processed ore increased from 15 (1956) to 47 thousand tons (1986). A number of employees in the factory were moved from 80 to 120. According to the world classification deposit in Pezinok is rated as middle-sized. Its function was to check south-east continuance of the antimony deposit. Mineralizations at Čierna porucha, Plochá and Peter seam were mined. Currently, there are numerous cavings in the adit.